Dare Snug-LGU-25 Garden U-Post Insulator. Designed to fit U-Post from 1in to 1 3/8in size. Yellow in color. 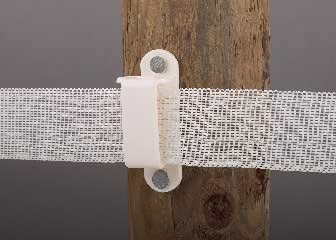 Great for temporary electric fencing for your garden. 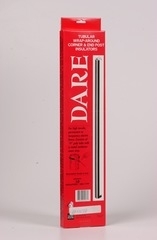 Dare #2544 Wire Vise End Post Fastener. Fits 8 & 9 gauge smooth wire and Cameo and Bayco monofilament. Round corner / end insulator for wooden posts. Wire wrap attachment to post. Molded of high density polyethylene with UV inhibitors. Black. 10 each per bag. For wood or vinyl posts. Use two galvanized roofing nails for wood post or two 8 x 3/4 inch stainless steel screws for Vinyl (nails or screws not supplied). Designed for polywire, polyrope or high tensile wire. Fits all T-posts and can be nailed on top of wood post. 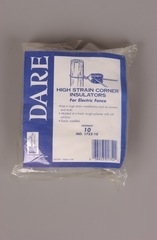 For all wire, polywire, polyrope and tape up to 1 1/2 inches. Will face all directions on Equine white post. For superior UV resistance. Performs in any climate. 4 in. long X 3/8 in. diameter. Ribs prevent insulator from sliding. Without staples. 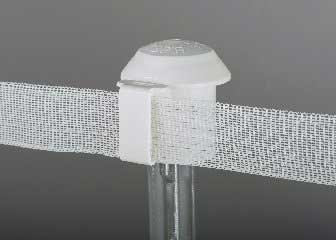 Tubular corner post and end post insulator provides insulation for 90 degree turn or end loop on any style post. Flat-sided design resists rolling and speeds installation. Heavy sidewalls provide extra protection against shorts or grounds. Molded of polyethylene with carbon black to withstand the elements. 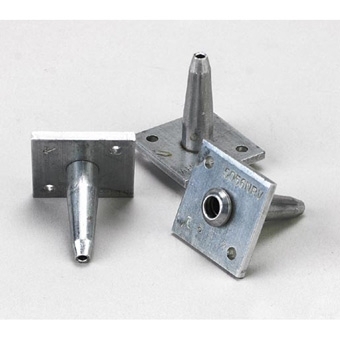 Metal insert designed to take high-tensile strain. 19 1/2 inches long. Clipper, wire to insulator fastening clip. 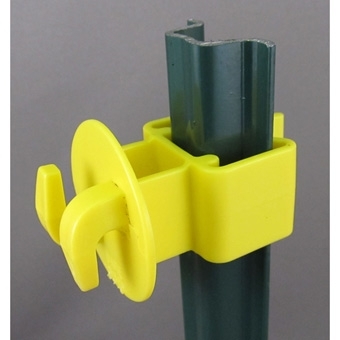 Handy spring clip for fastening electric fence wire to grooved insulators. 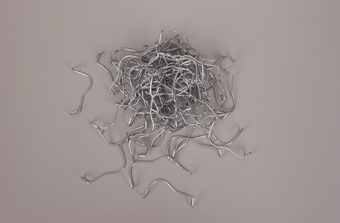 Galvanized spring wire. 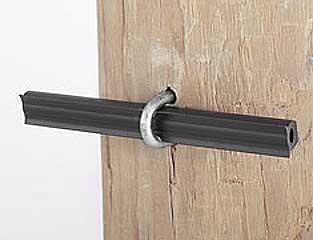 Pinlock Insulator for Wood Posts with two galvanized ring shank nails. Heavy cross sections withstand the pressure of high tensile fencing. Attached pin, locks and unlocks fence wire. Large flange prevents shorts and arcing. 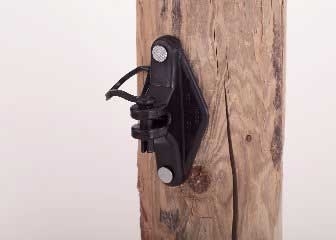 Wood post tape insulator for wood posts. White. Complete with galvanized ring shank nails. 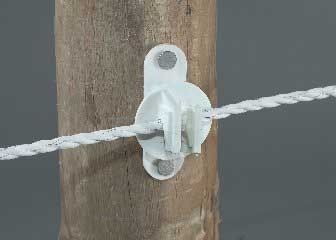 For any fence tape up to 1 1/2 in. wide. Insulators grip tape tightly to prevent whipping and sawing. Large flange prevents shorts and arcing. Heavy tape hold.